Need a healthy, yet delicious recipe to bring to your upcoming holiday party, or to prep in advance so that you can create meals on the go during the busy work week? 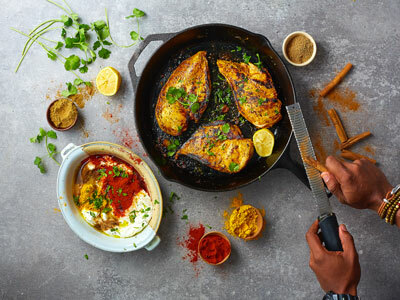 Kevin Curry, author of FIT MEN COOK and the founder of the FitMenCook online community, dishes up his Moroccan Chicken Recipe! Because we all deserve to eat chicken breast that is delicious, flavorful, and tender! This recipe demonstrates the importance of flavor combinations—adding more or less of a particular spice will impact the flavor profile. Using this method, you can learn how to make your own marinades and rubs. Slice thicker pieces of chicken breast into thinner pieces to help ensure that the chicken cooks uniformly and all the pieces are finished at roughly the same ti Pat the pieces of chicken dry with a paper towel. In a large bowl, mix together all of the marinade ingredient Add the chicken and mix together, ensuring that all the pieces are well coated. Cover and marinate in the refrigerator for at least 1 hour and up to overnight. Fire up the grill to 330°F or the oven to 425°F. If you are using a grill, place the chicken breasts over direct heat and cook for 4 to 6 minut Then turn them over and ideally move them off the direct heat source to finish cooking, 6 to 8 minutes, or until the chicken is cooked through. If you feel more comfortable using a food thermometer, the FDA suggests cooking to an internal temperature of 165°F to ensure safety. If you are using an oven, spray a oven-safe, nonstick 10-inch skillet with cooking spray or olive oil, then place it over medium-high heat. Add the chicken breast and sear on both sides for roughly 3 minutes per side, being careful not to burn the chicken. Place the entire skillet in the oven and bake until the chicken reaches 165°F, about 8 minutes. Serve warm with your choice of sides. You can store this in the refrigerator for up to 4 days; however, I recommend freezing any portion of chicken you will not eat within 3 days to maximize freshness and safety. Pro Tip: Season the chicken breasts, then cut them into chunks. Create kabobs with your favorite veggies, such as bell pepper, onion, and zucchini. For more healthy recipes, check out FIT MEN COOK by Kevin Curry! 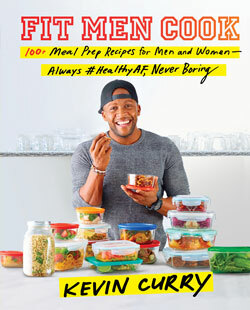 Excerpted from Fit Men Cook by Kevin Curry. Copyright © 2018 by the author. Used by permission of the publisher. All rights reserved. No one enjoys cookie-cutter meal plans, bland recipes, or eating the same thing every day. Instead of worrying about what to eat and how it’s going to affect our bodies, we should embrace food freedom—freedom to create flavorful meals, but in a more calorie-conscious way; freedom to indulge occasionally while being mindful of portions; and freedom to achieve wellness goals without breaking the bank. Kevin Curry, fitness expert and social media sensation with millions of followers and hundreds of thousands of downloads on his app, shares everything you need to live a healthy life each day—from grocery lists to common dieting pitfalls to his ten commandments of meal prep—as well as his personal story of overcoming depression and weight gain to start a successful business and fitness movement.